Can you imagine having a childhood without The Sleeping Beauty or The Lion King? Or a world without Disney’s whimsical optimism? Walt Disney pioneered the field of animation by following his dream of transforming the entertainment industry into what we know it as today. He found new ways to teach and educate. More importantly, his creative process helped other artists achieve their dreams too! Let’s learn his creative strategy and how you can use it to grow. As a co-founder of an entertainment conglomerate, The Walt Disney Company, and a creator of the world’s first large amusement park, Disneyland, Walt and his team members created a number of famous fictional characters such as Donald Duck, Mickey Mouse, and Goofy. This artist, creator, and director was also a winner of 7 Emmy Awards, 22 Academy Awards and Cecil B. DeMille Award. Additionally, he was awarded the highest civilian award of the U.S. government – The Presidential Medal of Freedom. How did he achieve all that? The answer is simple – by discovering creative ideas and converting them into reality. One of Disney’s “Nine Old Men” was Oliver Johnston, better known as Ollie. He was hired by Disney himself for $17 a week when the studio was expanding, and his job was producing full-length feature films. As someone who was with Disney from the beginning, Ollie observed that there were three Walts and that you never knew which one was coming to the meeting. Aside from the three Walts, when ideas were being developed, there were three different rooms used to investigate, discuss and refine them. Room 1 was used for brainstorming processes, where all ideas and dreams were presented. The other room, Room 2, was meant for storyboarding and sketches of potential characters for the story. Lastly, the last room was called the Sweatbox, and it was meant for putting the project under the microscope. Ollie’s observation about Walt Disney’s creative process was highlighted and modeled later in 1994 by NLP expert Robert Dilts. In this method, the group of people use a specific thinking flow which builds parallel thinking that can be used to generate, evaluate and critique ideas and solve problems. The key to Disney’s success was finding a balance between the three Walts. A dreamer without a realist cannot turn ideas into tangible expressions. A dreamer and a dreamer would be stuck in a perpetual conflict, and a realist and a critic could not create things that matter on a deeper level. A dreamer and a realist might create things, but they might not be very useful ideas without a critic, because a critic helps to evaluate and refine the products of creativity. So, how can you use Disney’s Creative Strategy in your everyday life and business to become more successful? Every creative project needs to incorporate the three aspects of creative imagination, practical action and critical refinement. 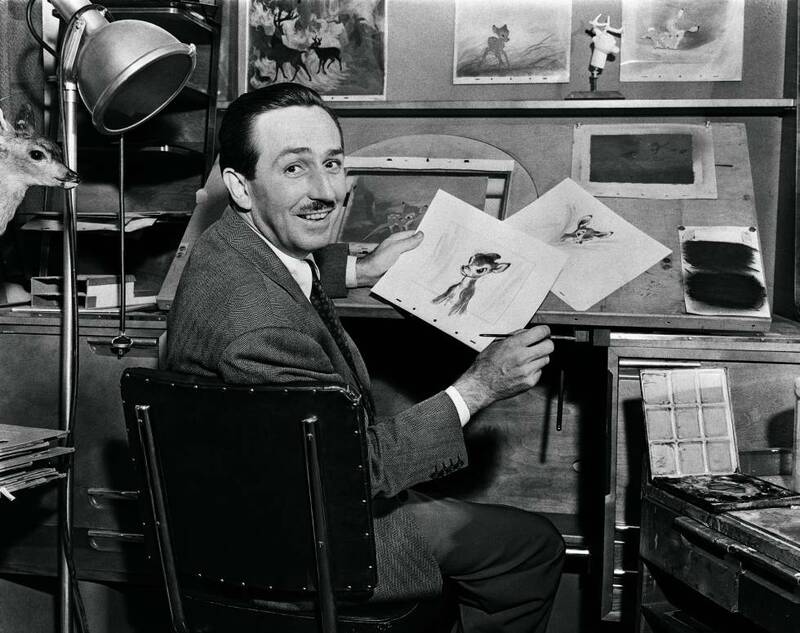 In the first phase of a creative process, Walt Disney allowed himself to be a dreamer. Any creative idea starts with a dream full of passion and enthusiasm. There are no absurd ideas, fantasies or wishes, nothing is censored and silly. For the Dreamer, all the things are possible. Of course, some of these ideas are viable and others are not, but the viable creative concept comes later as a result of the second and third thinking styles. -How would it look like? -What could I do with it? -How would it make you feel? -What is the most absurd idea I can conceive? Without the Dreamer’s vision, Disney’s movies would lack the touch of magic that sets them apart. The second phase of Disney’s creative process was taking the ideas from the previous phase and turning them into something possible and feasible. The Realist tries to figure out how to make the ideas work and sorts them into an executable plan. He believes that the dream is possible and that all the imaginary ideas can be turned into manageable actions. -What are the main features and aspects of the idea? -Can I build on ideas from the features or aspects? -What is the essence of the idea? -Can I extract the principle of the idea? -Can I make analogical-metaphorical connections with the principle and something dissimilar to create something tangible? -How can I use the essence of the idea to create a more realistic one? The last phase of Walt Disney’s creative process was reviewing all the ideas and trying to find flaws in them by playing the devil’s advocate. The critic thinking mode tends to discover the barriers of applying the idea and how to overcome it. In this session, the team provides a constructive critique for the idea in order to find the weak points and solve it in the final solution. -Is this the best we can do? -How can we make it better? -How does it look to a customer? A client? An expert? A guest? -Is it worth our time to work on this idea? So, how this works in reality? Let’s say that someone wanted to create an app for their business. The dreamer might suggest an app that can read your thoughts and talk with you like a real person. The realist develops this into a chatbot that have predetermined and personalized answers. Finally, the critic evaluates the idea for all possible flaws and problems, such as what if someone asks a question that is not predefined. Besides Disney’s creative process, there are a few advice from disney himself about creative process that you should remember. When you become curious about the world around you, you begin to ask many relevant questions. You will discover the world around you, you will move forward, maintain the engagement and interest. Disney’s theme parks and ideas never stopped growing and expanding. What Disney is trying to say is that you can continue to grow and imagine every day. The only limits are the one that you are creating for yourself. Reach your expectations and don’t be afraid to surpass them! Pursuing your dreams is not easy – there can be many setbacks and many different roads to take. That’s why pursuing your dreams is a courageous thing to do! Loving what you do and being inspired by your work is the best push you need to achieve great things. If the intention that drives your creative process is love and willingness to engage, nothing can stop you. There is not anyone who succeeded didn’t do things that others believed were impossible. If Walt Disney thought that his dreams were impossible, our childhoods would not know the movies we watched on repeat and the world would not be richer for a few everyone’s favorite theme parks. We hope that these Disney’s lessons and the Creative Strategy can help you improve your life and your work. Keep looking forward, opening new doors, and doing great things!